Browse for your Maui photographer with ease. The Maui Photographers Organization was created in order to help those in search of a great photographer. Find one without looking in a million different places. The following pages have descriptions and contact information submitted by each photographer along with examples of their work. Take a gander below to see the different specialities practiced by Maui photographers. One of the most popular searches for a Maui photographer is for wedding photography. We have hundreds of Maui wedding photographers on the island. Here you can browse through each one and choose the photographer's style that suits your wedding the best. Anyone coming to Maui should make sure to get a portrait done on one of the many gorgeous beaches surrounding our island. 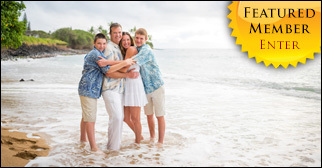 We have assembled many expert Maui portrait photographers for you to choose from. They specialize in Family portraits and vacation portraits as well as senior portraits. Small and large groups are welcome to get their portraits taken in paradise. Fine art photographers are quickly out-selling the other artists on the island. Often you'll find that the Maui fine art photographers have galleries that exceed capacity. We've listed many of the best artists on the island of whom sell prints and some that have full galleries. Maui is home to incredible landscapes found nowhere else in the world. These photographers have captured Hawaii's magical spots to share with us. Fashion is quickly becoming a major part of Maui's photography scene. With countless perfect settings, it's easy to see why so many Maui fashion photographers are around. Maui is constantly voted as #1 for best beaches and best island in the world. Unblemished, perfect beaches as well as majestic mountains and breath-taking waterfalls lend the scenic beauty needed for amazing fashion photography. One of the biggest, if not the biggest, industry in Maui and Hawaii is real estate. Maui real estate photographers are the strongest asset to agents looking to sell property. Maui has some of the best real estate photographers in the world with loads of experience shooting indoor and outdoor, from your Maui condo to your luxury Maui vacation rentals. Maui has many other Commercial categories of photography. You'll find a wide range from Maui food photographers, to Maui sports photographers on our incredible island. We also list the best Maui Videographers. The Maui Photographers Organization is constantly updating its lists as well as looking for new categories. Please contact us with any new ideas for Maui photographer categories. Now you can rent gear for any island from Hawaii Camera. Never be without the best photographic gear again! With Hawaii Camera, you can rent lenses, camera bodies, lighting, waterhousings, iPads, GoPros, PA Systems and video equipment in a flash! (both Nikon and Canon.) Whether visiting the islands or full-time professional resident, you can have back-up gear or try new equipment before making an expensive purchase. Become one of our listed Maui photographers! The Maui Photographers Organization is accepting all photographers on the island. All you have to do is follow our Quick Guidelines, and you'll have your own page on this site as well as be listed among our multiple lists on the web. It should only take you 15-20 minutes to write your profile and to email us your pictures. Our goal is to give equal representation to every photographer on Maui! The catch? A small fee. Contact us if interested. This site is run by professional web designers, social media managers, and web marketing experts. We will continue to optimize and market this site until it is easily found on other websites and in search. We offer packages of advertising available in the banners above. We only have 2 relevant banners per page to keep from over-crowding the website. Maui is a magical place, and we want to spread the aloha by offering this service to the many talented Maui photographers on the island. Mahalo for joining us!